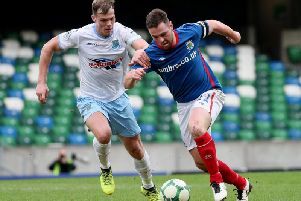 Rodney McAree said his Coleraine side were determined to pick up the points against Newry City after previously struggling against the border outfit this season. The Bannsiders had only picked up a solitary point against the basement club in the two previous meetings this term. But they put that right on Friday night running out 4-1 winners at Newry Showgrounds much to McAree’s delight. 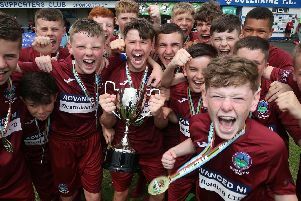 “The last time we played Newry at our place it was a disappointing evening for ourselves and we knew the Newry players would have enjoyed their journey home,” he said. “We wanted to reverse that and it wasn’t about revenge or anything like that, but we needed to make sure that we came here and gave a good account of ourselves. “I thought we did that and the sending off was harsh from Newry’s point of view as I don’t know what Dale Montgomery has done wrong. “I thought up until the sending off we started the game very well, thought we played more football than what we did last week which was encouraging and it was an enjoyable evening. “We didn’t start the second-half well and when Newry were reduced to 10 men we were a little bit sloppy. “We probably didn’t cover as well as we did in the first half and maybe that was a little bit of complacency. “For two or three minutes after that, we conceded another couple of opportunities, so it was a ten minute period which we needed to overcome and get ourselves going again. The Bannsiders boss was also pleased to see his side respond positively to last week’s heavy derby defeat. “It was important for us to just get back onto the pitch,” he said. “It was a horrible result and it was a result our supporters didn’t deserve. McAree made six changes for the game and had special praise for veteran defender Steven Douglas who rolled back the years with an imperious performance at right back. “I thought Steven Douglas, who at 41 years of age and who hasn’t played much football recently, was marvellous,” he said. “There are boys sitting watching games other weeks and they are seeing us lose 4-0 last week and wondering ‘when are we getting an opportunity’?